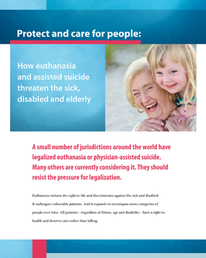 ​about assisted suicide and euthanasia. Alex Schadenberg was the featured speaker at the 2015 MCCL Legislative Dinner. His insights into the dangers of legalized assisted suicide brought clarity to the issue for the elected officials and MCCL members in attendance. Click the video at left to view his presentation. We at MNAAS believe that there is always a way to help someone who is suffering physically or mentally which is far better than ending his or her life. We hope that you will help us to stop legalized assisted suicide from putting vulnerable lives at risk.